Why are the Islands important? The Marietas Islands, the Mexican Galapagos A wonderful hidden beach that was falling victim of its own beauty. Just as songwriters Glenn Frey and Don Henley from The Eagles wrote in 'The Last Resort', "You call someplace paradise, kiss it goodbye", the Hidden Beach was close to kicking the bucket thanks to its unique beauty. In the pre-social media times, the Marietas Islands were a placid, untouched and pristine pair of islands on the way out of the bay, but one day, maybe innocently, someone shared a photo of a beautiful beach in what looked like a crater on Facebook, the post exploded online. Suddenly everyone and their neighbor wanted to visit the place and so they did! Thousands wanted to go to the beach in the crater, the hidden beach at the Marietas Islands, and dozens of tour providers, plus hundreds of smaller boats and cruises stepped up to supply the growing demand. Suddenly the small islands were overrun by ships, tourists and the negative aspects too, pollution, trash and damage to the local coral reefs, including the delicate ecological balance. The Marietas Islands, the Mexican Galapagos Thanks to a timely and aggressive intervention by the local environmental protection authorities, local scienti c studies and a measured reopening of "Lovers' Beach", this impressive local attraction is once again available to tourists, but in a very controlled manner. Even so, visiting the Marietas Islands (Islas Marietas) is without a doubt one of the activities you should add on your short list of tours and adventures you'll want to enjoy during your stay in Puerto Vallarta or other locations in the Bay of Banderas area. Things to do at the Marietas Though most people have just one thing on their minds when you mention the Islas Marietas, we'll help you nd out that there are lots of things to do here, even some you didn't even imagine. Here's our list of what to do on and around the Marietas archipelago. The Hidden Beach (Lovers Beach / Playa del Amor) This is the main attraction, you need to get there early and fast, so you grab one of the 116 spots a day. Mondays and Tuesdays the beach is not open to visitors. You'll get a special bracelet, a helmet and a life vest which you will have to wear at all times. Access to the beach is 30 minutes and it includes the time you take to get there and back. You'll be swimming through a 50foot long small tunnel carved by the sea through the rock into the hidden beach and impressive crater. There is a 12-year-old age limit and you need to know how to swim (the faster you swim, the longer you are on the beach!). Swimming & Snorkeling The warm waters and the incredible abundance of underwater organisms make this a great spot for snorkeling as well as just swimming around. There are a few spots that are available for these activities and your tour providers will take you to the best ones at the right time of the day. Don't forget that you now need to keep your life vests on at all times when you are in the water, so don't plan on going skin-diving, that is just not an option anymore. The calm waters are very clear so the visibility is great, you'll see a lot of sh and sea life even from a distance, so don't despair. There are 15 coral species building the reefs, (some examples, Pavona gigantea, Pocillopora verrucosa, Porites panamensis and Tubastrea coccinea). Molluscs include the following: giant Mexican limpet (Patella mexicana), cup-and-saucer snail (Crucibulum scutellatum), burra clam (Spondilus calcifer), ink snail (Purpura patula pansa) and the pearl oyster (Pinctada mazatlanica), among the echinoderms we can mention the brown sea cucumber (Isostichopus fuscus). The Marietas Islands, the Mexican Galapagos The reef sh species, that enjoy protection in the corals and an abundance of food in these waters, include King Angel sh (Holacanthus passer), Panamic Sergeant Majors (Abudefduf troschelii), Cortez Chubs (Kyphosus elegans), Giant Damsel sh (Microspathodon dorsalis), Moorish Idol (Zanclus cornutus), Cortez Rainbow Wrasse (Thalassoma lucasanum), Giant mantas (Manta birostris), Moray eels, Mexican goat sh (Mulloidichthys dentatus), Blacknosed butter y sh (Johnrandallia nigrirostris) and maybe even sea turtles. Scuba diving Banderas Bay is considered one of the most beautiful bays in the world and the underwater version of it may even be more impressive and full of beauty. The bay is also well known for its depth and all things combined make it one of the best scuba diving locations in all of Mexico. We can thank the famous marine biologist and conservationist Jacques Cousteau for the Marietas Islands Marine Reserve, a paradise of untouched tropical beauty, above and below the waves. The Marietas Islands, a natural wonder, are part of an underwater mountain range that pops up as the small amazing islands over the surface of the ocean water. Visibility and the warm waters make it ideal for both experts and beginners and one of the top scuba spots in the area. Because the Islands and the waters around it are part of a National Park, it is a shelter for a rich array of underwater species, large sea turtles, dolphins, and giant manta rays are commonly found here in any season. December, the start of winter in the area, is when humpback whales start arriving at the bay, they stay several months here and give birth to their calves. Beaches on the Marieta Islands The islands offer a number of beautiful beaches, all of them small and cute, the most obvious one, the Hidden Beach (Playa del Amor), La Nopalera Beach, Los Escalones de Piedra Beach, Pavonas Beach, Cueva del Muerto (Deadman's Cave), and Amarradero Beach. Bird watching The islands are a protected bird reserve too, you'll nd many different species here, the large frigatebird (Fregata magni cens) that is like the pirate of the airspace, stealing morsels from seagulls and others. There are also herons, egrets, many different seagulls, pelicans, brown boobies (Sula leucogaster), Red-billed tropicbird (Phaethon aethereus) and the world-famous Galapagos Blue-footed booby (Sula nebouxii). This lovely booby, with its smurf-blue feet, is, certainly, the bird-enthusiast attraction on the island. Big fish andÂ Cetaceans If you travel from Puerto Vallarta or Nuevo Vallarta to the islands it is not uncommon to encounter various sea mammals, there are a total of 11 species that live and breed here. The most common are the dolphins, but you can also nd orcas (killer whales) and from December to March (during the Winter months), if you are lucky, you'll meet the giants of the Bay, the humpback whales (Megaptera novaeangliae), the bay is their centuries-old breeding ground and a place they use to rest during their yearly migration. You might also be able to observe the Whiptail stingray (Dasyatis brevis), the Scalloped hammerhead shark (Sphyrna lewini), Silky shark (Carcharhinus falciformis) y Sand tiger shark (Carcharias taurus). Water sports If you are traveling on one of the larger vessels that sail to the islands, you surely won't be visiting the hidden beach, which is a trip done in small boats early in the morning. Big cruise catamarans and boats offer other options that the smaller ones don't, so you can enjoy an entertaining trip with other fun activities. They normally have kayaks and Stand Up Paddle-boarding, so you can oat around the warm waters and explore the rocky caverns and go through archways the sea has carved out for you. Keep an eye open for the harmless giant manta rays, sea turtles and maybe even a dolphin pod. Interpretative Trail on Isla Larga (Long Island) The National Commission of Natural Protected Areas (CONANP) has opened an interpretive trail that starts off on La Nopalera beach on the northwest end of Isla Larga (Long Island) at the Islas Marietas National Park, a new sustainable tourism option. Visitors take guided visits along the 1000 ft interpretative path where you can observe birds, as well as appreciate the scenic beauty of this National Park, maybe even nd a reptile which include the Mexican spiny-tailed iguana (Ctenosaura pectinata), green iguana (Iguana iguana), Many-lined Whiptail (Cnemidophorus lineattissimus), among the snakes the night snake (Hypsiglena torquata) and the Neotropical Whip Snake (Masticophis mentovarius varilosos) plus its vegetation and owers (12 families and 25 species, including Euphorbiaceae and the most common species are Cyperus and Chamaesyce), a Natural World Heritage Site, a UNESCO MAB Biosphere Reserve and RAMSAR site 1345. Enjoy the 92 bird species that live on the island including the brown booby, the blue-footed booby, the frigate, Red-billed tropicbird and the Heermann's gull (Larus heermanni), as well as endangered species such as Townsend's shearwater (Puf nus auricularis) and black storm petrel (Oceanodroma melania). The Hidden Beach (Lovers' Beach) The islands are now, as stated, quite famous for what is known as the "hidden beach" or Lovers' Beach (Playa del Amor), a unique beach that can easily be spotted from the air through a crater in one of the islands, from the sea it's not that obvious as there is only a small tunnel when the tide is low. This underground beach was, as you can imagine, concealed from view for quite some time and was actually found thanks to, no less, those very bombs that were destroying the island, talk about a mixed blessing... You could get into the crater by either jumping off the ledge on top and into the sea below (not recommended and actually forbidden) or swimming through the short tunnel carved by the sea from the ocean side and into the crater, where you'll be able to land on this incredible beach. It's a bit scary and exhilarating at the same time to go through this tunnel, especially when the waves bring you close to the top of the passageway. UNESCO Biosphere Reserve & National Park A natural landmark of the Banderas Bay, the Islas Marietas are among the most important spots in all of Mexico and the Eastern Paci c tropics for marine bird watching and it is a protected shelter for innumerable marine species. Since April 25, 2005, this wildlife refuge has been known as the "National Park Islas Marietas", and it's also a "Reserva de la BiĂłsfera", that is, a UNESCO Biosphere Reserve, since 2008. So, you can see this is actually a very unique place to visit, but one that you must take care of and respect, so follow the established rules to safeguard the species that depend on this park (CONANP, 2008). It is home to several endangered bird species such as the Blue-Footed Boobie that can only be found on the islands of the Sea of Cortez and the Galapagos Islands in Ecuador. The Marietas Islands have a total surface area of 1383 hectares, of these 1305 are open to tourism. The island offers nesting, reproduction and resting area for seabirds, sh, marine mammals and 78 hectares of coral reefs.Â The depth of the ocean water around the islands is between 70 and 110 feet. o not feed or touch the wildlife on the island. D Don't make loud noises and help avoid disrupting the natural behavior of the island's creatures. Obviously, you can not catch, disturb, remove or destroy wildlife, their eggs or other elements related to them (nests, food, etc.) Please do not take anything o the islands. Do not destroy nests, feeding sites, resting or reproduction areas on the island. No extreme sports are permitted on the island, this includes rock climbing. No bonfires or open fires on the island, if you smoke, take the cigarette buds with you, as well as any other garbage. Bring and use biodegradable sunscreen. No camping, drones are no longer permitted over the islands without a special permit. So now you know, if you want to visit a unique place, with a unique nature, rich underwater sea life and the hidden beach, you can book a tour with a number of reputable companies. We have a short list of highly praised tour providers here. How to get to the Marietas Nowadays, the best way toÂ get to the islands, that are only accessible by sea, is with a reputable and authorized tour company (you can nd some here - we recommend Ecotours de Mexico and Vallarta Adventures). First off there are the environmental concerns, secondly, the local Environmental Of ces need to approve those that travel to the isles, third, they must know the area well, tides and other issues (stinging jelly sh, for example) that could stop you from accessing the beach or islands. We do not recommend renting a motorboat (lancha) or a water taxi to take you there, as some other sites recommend, this might have been ok in the past, but not now. Important Notice: As many might already know, the Marietas Islands and more speci cally, the Hidden Beach became, and still is, a viral subject online. Photos and videos covered the internet and were shared so much that a beach that was rarely on any tourist's bucket list became the top activity on your trip to the area. This sudden popularity became an issue when thousands of visitors mobbed the beach and hundreds of boats would arrive at this small delicate island ecosystem causing all kinds of unintended damage. 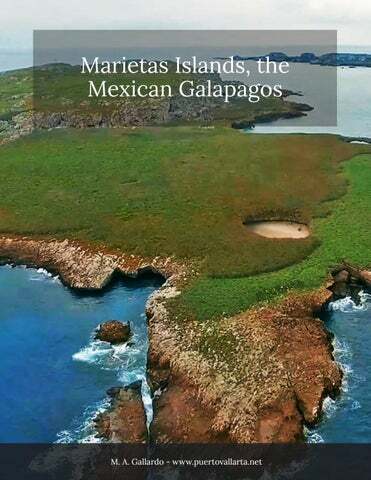 The Marietas Islands, the Mexican Galapagos Since recognizing the issue, authorities limited access to the hidden beach to a maximum of 116 people a day and boats can't carry more than 15 passengers. Entry to the beach is strongly and unerringly enforced by Mexican National Park guards and passage is given on a strict rst-come, rst-served basis on low tide moments of the day. Entry is done in groups. Once 116 passes are reached, nobody else goes in. From the moment you get in the water you have 30 minutes to get to and back from the beach. Access is delimited by a line of buoys. Both tour providers and you need to pay a special entry permit (the money is reinvested in the park and access control), you get a special wrist band and are provided with of cial helmets that identify you as authorized, you must also wear a life vest, no snorkels or ippers are allowed. This means that there actually is a sort of race to get there each morning on the days that there is access, if your tour is really going to the Marietas Islands' hidden beach, you'll start off very early in a small group on fast motor boats. If that is not the case, don't expect to visit the beach, instead, you'll be given some lame excuse regarding tides or something else. The price is also a clueÂ when it comes to access to the beach, if it's too cheap, you most surely won't get in. The Marietas Islands, the Mexican Galapagos If you insist, the best option for a DIY trip would be to start off from Punta de Mita at Anclote Beach or at the Embarcadero. You'll nd motorboat owners that might be able to take you there, the distance is around 5 miles. You'll be able to visit the areas that are not protected on the islands, you won't get into the underground "secret" beach, but there are enough nice spots around the island to make the trip immemorable anyway. Most reliable tour options take you there from PV, Nuevo Vallarta, Bucerías and elsewhere in the southern part of the bay. The price and the sailing time goes up, but it's the only way to go if you want to get into the famous Lover's Beach (Playa del Amor). 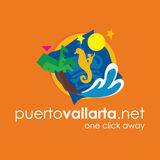 In the case of a trip from Puerto Vallarta or Nuevo Vallarta, it'll take around 1 hour one way by sea. An upside is that you'll get the chance to see dolphins, orcas and maybe even whales if it is December to March. If you are going to the Marietas from towns further north, like Sayulita and San Pancho, you, once again, have options by sea or by land. The cheapest, though not a direct option, is to take a public transport bus (camión) from Sayulita or San Pancho heading south to Bucerías/Puerto Vallarta. Once you get off in Bucerías ask for the "camión" to Punta de Mita, you'll backtrack along the highway before taking a left off the main highway to Punta Mita. It'll be some 40 to 50 minutes depending on how coordinated the buses are (a matter of chance). Other options include taxi (check at the main square) and Uber. Important tips ake snorkel gear for swims outside the hidden beach area, fish and sea life biodiversity is impressive. T Take into account the tides, if the tide is high, tunnel access might be blocked or forbidden. Take into account the sea, waves, and jellyfish, that might also block your safe passage to the beach. A reputable tour company will take these things into account. If you go in a small boat from far away, you may just get seasick and you won't enjoy the trip at all, do take this into account too and take some medicine some hours before the trip. It's a very popular tour, so don't wait until the last minute to reserve, it might just be sold-out. Mondays and Tuesdays the hidden beach is closed. Take snorkel gear, the fish and biodiversity there are impressive. More on the Los Arcos Marine Park and other scuba and snorkel sites. Location Map The Marietas Islands are a group of small uninhabited islands southwest of the town of Punta de Mita, on the coast of the state of Nayarit, Mexico. It is located in federal waters 5 miles from the Punta Mita peninsula in the Bahía de Banderas and some 20 miles in a straight line from Puerto Vallarta, where most of the Hidden Beach (Playa del Amor) tourists come from.